The young man's words conveyed a range of feelings, from confusion to anger, and, sometimes, momentary happiness. His name was Hiroaki Nishimura, an American citizen interned in the Japanese American Internments camps during World War II. He is also the father of Julie Nishimura, who co-founded Distant Voices Touring Theatre her husband, Danny Peak, who turned Hiroaki's journals into a moving live performance. "Distant Voices" is presented as a reading by Peak with details from newsreels and historical documents read by David Stradley and Michelle Jacob adding context to what was happening. The 15-minute excerpt from the 70-minute piece simply told Hiroaki's firsthand story -- parts of it -- without commentary. It's a powerful piece that begs many questions; and in all presentations of "Distant Voices," whether at a school or library or museum, includes a question and answer session. At the DVTT Salon on November 21, the discussion was largely centered on anger. Hiroaki's journal entries showed disappointment and resentment, but no anger and little despair. Guest Hiro Nishikawa of the Japanese American Citizens League shared more stories of young interned men revolting, sometimes leading them to harsher, high security camps, and of men -- Americans, remember -- refusing service when their draft numbers came up even though it meant giving up more freedom for prison. Yet many men did serve, even while their families remained in camps. It's easy to see how the discussions can cover days, as it does when DVTT brings the show, along with pre-preparation sessions, to schools. The second part of the show brought us into the 2000s, with an excerpt from the post 9/11 piece "September Echoes." The full show explores the aftermath of the attacks from several points-of-view; the 15-minute excerpt focused almost exclusively on a young Syrian in Seattle named Nadin. Nadin's family's home was raided by Immigration and Naturalization Services after 9/11 and she and her parents were held for nine months. Her story was taken from a speech she had given, delivered powerfully by Michelle Jacob. There are some obvious parallels between Nadin's and Hiroaki's stories, as well as contrasts. Distant Voices offers educational programs for middle and high school, including workshops and a 45-minute show. often free of charge. To help fund these educational programs, DVTT will be holding a wine tasting benefit on Sunday, December 19 from 1:00 to 4:00 pm at Deerfield Fine Wines in Newark. The event will include a selection of 25 wines, entertainment, free child care and a discount on wine purchases for a $10 suggested donation. For more information on the benefit or to find out more about the outreach programs, contact Danny Peak at dpeak@udel.edu. From the moment the lights go up, you can’t help but notice Jacie (Courtney Wallace) give a broad but quiet smirk as she plays the nurse on a hackneyed production with the unctuous doctor, the sobbing mother and the son who is being told he will have to lose his foot. And suddenly, the doctor is not only unctuous, but full of ‘u’s, reassuring the mother and son that he will ‘umputate just below the unkle’….and then the exasperated director rants that his techs must fix this actoid, a robotic actor. And make sure he stays away from the fax! Wallace’s Jacie is the light that keeps the stage going as she plays an actoid with a heart – a heart that begins to warm to the company director’s nephew. She is wonderful, spewing past scripts on cue for any event she had not been prepared for, and the results are fantastic – like pushing a button on a Chatty Kathy. 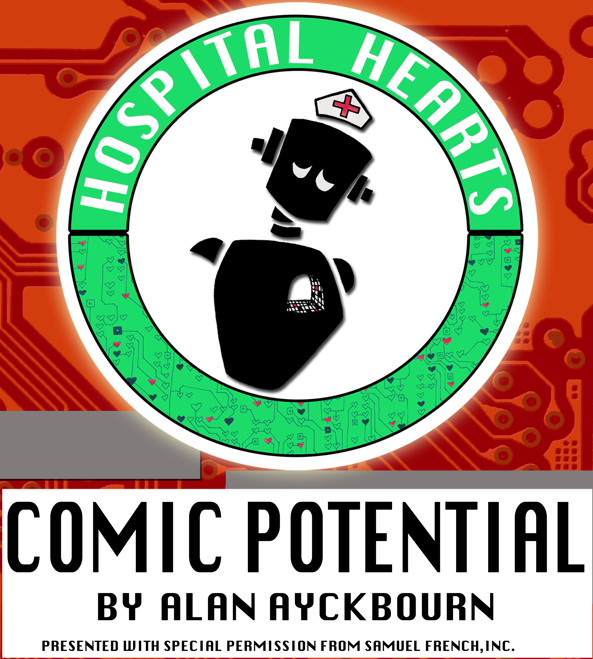 This futuristic comedy had a slow start on opening night but everyone seemed to warm up to the enthusiastic audience. Courtney Wallace has that rare ability to act like an actoid and really act within her spurts of role – including outrageous hamming and miming. 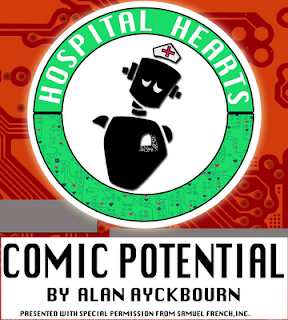 Mike Freeberry as Adam Trainsmith had perfect pacing – first keeping a shy and quiet demeanor as he visits his uncle’s production set and then blossoming into an inventive writer as he falls for Jacie the actoid and realizes his own Comic Potential. Dina Bogino and Bill Starcher not only provided excellent comedy in the smaller roles, but their synthetic actoid acting was perfectly done – with exact repeats and total freeze motion. The set was brilliant. Joseph Pukatsch built a great backdrop of moveable pieces that converted into different sets in seconds with excellent work by Robert de Remigio’s crew. This absolutely made the second act – allowing us to zip back and forth between scenes as if we were watching the sort of futuristic television production playwright Alan Ayckbourn envisioned. Back when (or, possibly, where) I studied art in the early '90s, there was a clear division between the technical and what is considered "fine art." Fine art students like myself didn't take computer classes. Not even Photography students -- and this was at one of the top art schools in the country. I thought it was pretty silly, even then. I didn't have my own computer, but, it seemed to me, what could be more "modern" than using computers in modern art? I took a computer class and was one of only two students who were not graphic design majors in the room. I felt over my head -- programs were more complicated 1992, and I didn't even know how to use a mouse -- and I never created anything memorable in that class. Still, I believed that computers and art were meant to be together. Today, of course, computer technology is more accepted in the arts than it was 20 years ago, but I still get excited when I see an art show with work created with the computer as a medium. "Allergen," an exhibition of illustrations by Patrick "PDub" Warner now on display at Union City Grille, is one of those shows. You wouldn't necessarily know it when you first walk into the gallery -- some of the pieces are huge, much larger than a typical physical digital piece. Warner explained that, to create pieces that large, they had to be printed by a sign company, who essentially made giant color copies on a special poly canvas. The result is striking, with bright, bold colors and a glossy finish. Warner is a commercial artist, and some of the pieces were converted from his own commercial work, giving it a genuine "pop" feel. 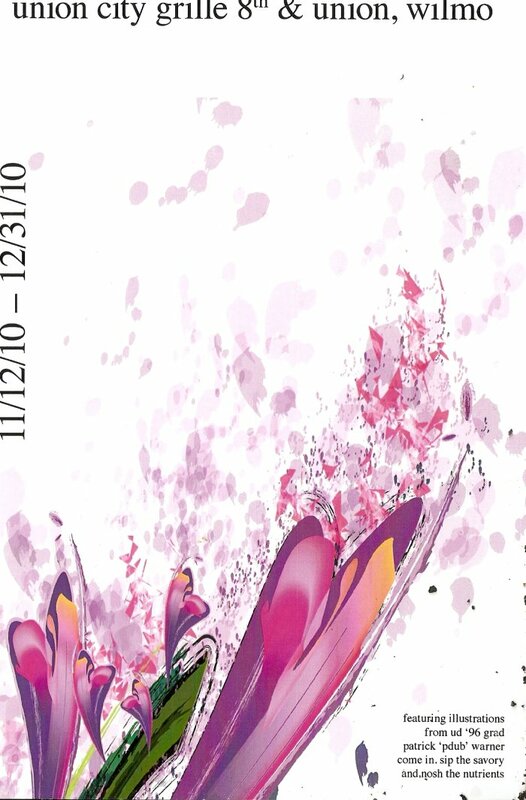 Several pieces represent flowers (a lily, a rose and an orchid) floating over a background of vintage war imagery. Other pieces feature a zip-gun, a frog, a rattlesnake and a spectacular larger-than-life parrot. My favorite pieces are one appropriately titled "Sunflower Galaxy" and the show's title piece, "Allergen," a violet explosion of flora and splashes of "ink" and "paint." The image on the opening postcard doesn't do it justice -- this is one worth stopping in to see in person. "Allergen" runs through December 31. Delaware is truly lucky to be home to a musician as talented and versatile as Xiang Gao, creator and director of 6ixwire Project. Best known as a brilliant violinist, this Chinese born artist has set out on a mission to bring together east and west, old and new, the familiar and unfamiliar, through his musical and dramatic endeavors. 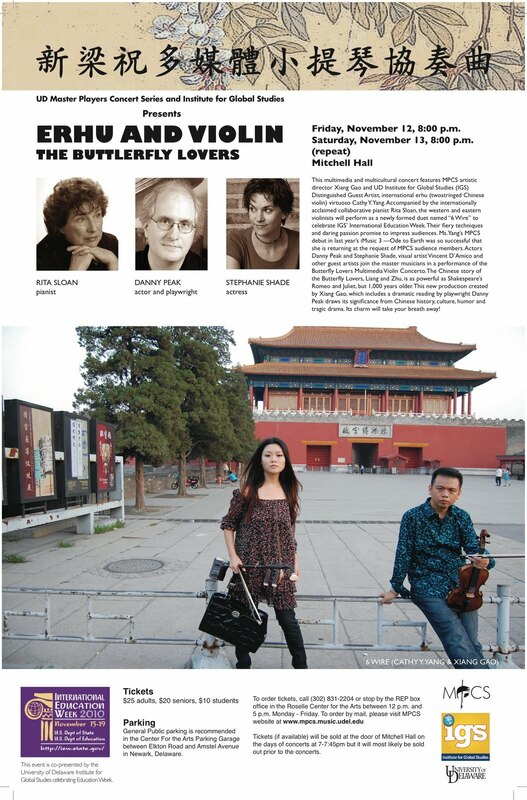 As part of the Master Players Concert Series, the University of Delaware presents Erhu and Violin and The Butterfly Lovers. The Butterfly Lovers is a collaborative effort between Gao and playwright/actor/director Danny Peak. Peak wrote the powerful narration, based on a centuries old Chinese folk tale. 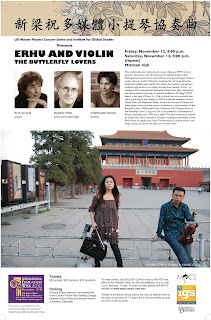 Gao arranged the music—a concerto written by Chen Gang—for violin, erhu and piano. With beautiful images by Vincent D’Amico projected behind the stage, the performance draws the audience in on a personal and emotional level: love, betrayal and loss are ideas everyone can relate to. To see Cathy Y. Yang play the erhu, a Chinese two-stringed violin, is to witness pure joy. Each sound that comes from the instrument is perfectly executed and seems to emanate from her soul. The ensemble playing between Yang and Gao is astounding; the two not only echo each other’s phrases, but also the timbre of the other’s instrument. The folksy themes—at times joyful, playful, and filled with longing—are those of the ill-fated lovers, Shanbo and Yingtai. Stephanie Shade reads an earnest and strong-willed Yingtai, a brilliant young woman who disguises herself as a boy so she might have the opportunity to study. Peak is the young Shanbo, who is completely taken with his lover’s beauty and intelligence. Their performance intertwines perfectly with the music and the visual elements. Also delightful is Rita Sloan, an award-winning pianist and faculty member of the University of Maryland School of Music. The second half of the program includes Pablo de Sarasate’s Themes from Carmen, Fantasy Op. 25, scored for violin, erhu and piano. Another expert arrangement by Gao, the piece showcases the players’ virtuosity. The last portion of the evening features a jam session with fabulous amateur musicians. Their rendition of Van Morrison’s Moondance rocked the hall. Gao spoke about music and its purpose in the world, reminding us how he enjoys working with varied genres and performers. He also gave us a brief bit of music history, discussing the shared Persian roots of violin and erhu. Here, Gao has successfully married the instruments and styles to expand our musical and cultural horizons. Colleen Daly sang the role of Violetta in the Opera Delaware production of La Traviata on November 7 with graceful acting, poise and magical melismas which soared to daring heights of C and D-flat without straining. From the haunting cello lines in the overture to the luscious ballgown Violetta was wearing in front of moveable dressing room mirrors, everything was smooth as silk. The mirrors rolled away to become windows in Violetta’s luxurious ballroom as she stifled her tubercular cough to become the hostess with the mostess. Her control melted as her admirer, Alfredo (sung with powerful passion by Alok Kumar) slowly became courageous enough to declare his love. Kumar’s tenor was so rich that his tone remained round and full – resoundingly secure, even in passages where the orchestra was silent. He built in intensity from his shy brindisi, his happy bollenti spiriti, to his tortured che feci. Maestro Mark Graf coordinated the solos, duets, trios, quartets with aplomb – and pulled a great performance out of both singers and orchestra, especially the Finale. The duet between Germont (Brian Carter) and Violetta was incredibly gripping. Germont paced himself as he slowly built his arguments to convince Violetta to release her hold on his son. 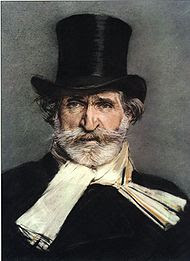 When he pulled his last trump card, telling Violetta that illicit love is bound to fade (Un di, quando le venere il tempo avra fugate), his voice was unctuous--fatherly but threatening with doom--and his song was punctuated perfectly by the strings. The clarinets, smooth and melodic throughout the opera, added poignancy to Piange, piange. The lighting gave us the illusion that the moving mirrors had become windows with panes. That and the detailing of the costumes with showy petticoats and beautiful shiny materials just put a cherry on the top of a beautiful production. Next shows are November 12 and 13. And the Verdict Is…Excellent Collection! Last month, fellow Arts enthusiast and advocate Bill Shea invited community members on a guided tour of The New Castle County Courthouse Art Collection. While I arrive late to the start (again: DO NOT BRING CELL PHONES), I was thankfully not alone. Three tardy comrades (the cell phone thing again) and I made our way to the 12th floor for a "self-guided" adventure, hoping to catch the group. The indoor and outdoor collection, acquired by the Courthouse Art Committee, contains works of 10 artists--both local and national--with four pieces specifically commissioned for this endeavor. My favorite pieces included Untitled (2002; acrylic on board) by Tom Bostelle; photographs detailed with watercolor overlay by Richard K. Hermann; Kinetic Sculpture (2007) by Tim Prentice which hangs in the main lobby of the courthouse; and several by Daniel Teis, whose diverse works of abstract textures and colors can be found on nearly every floor of the building. Artist Margaret Winslow, an active member of the New Wilmington Art Association, served as curator for the tour, which ended outside at the brillant steel & neon sculpture entitled Beacon by Brower Hatcher. I asked Margaret about her favorite piece in the collection: Gregor Turk's Con/Text, a rubbing of wax & oil on paper, which wasn't featured in our tour catalog but is a must-see on the list. Next time you're out & about downtown, take some time to view this fantastic collection. But P.S. Did I mention: DO NOT bring your cell phone! 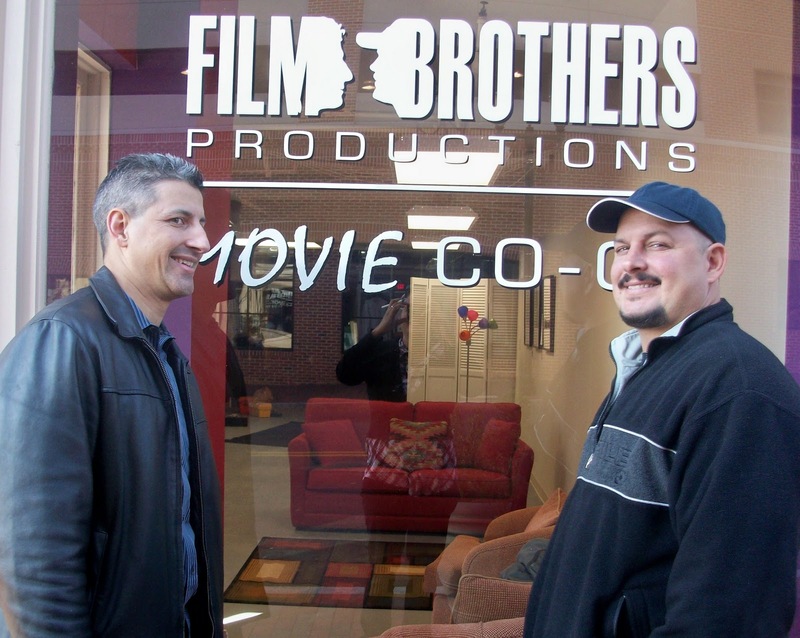 Brothers Gordon and Greg DelGiorno have been running their production company, Film Brothers, since 1999. They started with a focus on making feature films, but found that it was their special events brought in much of the revenue. They run the annual Film Brothers Festival of Shorts (which has been held under the umbrella of Fringe Wilmington for the past two years), and have branched out into areas such as online video commercials for small businesses, and their newest venture, the Film Brothers Movie Co-op. The first thing Gordon wanted to make clear about the Movie Co-op -- about to inhabit the space at 205 N. Market Street -- is that it's not just for filmmakers. "It's for all kinds of artists, musicians, writers," he says. The space, a combination gallery, lounge, office and screening room (with additional adjacent space for bands) is not just the 10-year-old production company's home base, it's also going to be a space for the arts in the community. Maybe you need a place to show and sell your artwork or put on a performance for one night -- through the Co-op, you can essentially rent the space for a reasonable fee and use it to suit your needs. Seating can be added, parts of the room can be sectioned off, wall space can be utilized. By day, the space will be open from 11-4, so artists can find information, network, work on their laptop and help the co-op run smoothly. The arts is only one part of the picture, though: the co-op is also about brings businesspeople together with artists. "Art is about doing business," Gordon says. Both businesspeople and artists sometimes fail to recognize the importance of the other, to the detriment of both. "You have people who have creative ideas, but they don't know business," says co-founder Greg DelGiorno. "Business people know that creativity is important, but they might not be that creative. We want to bring businesspeople and artists together." They also want the local politicians to commit to supporting the arts in Wilmington. At Wednesday's grand opening of the LOMA Coffee Shop a few doors down, Gordon issued the politicians, including ribbon-cutter Governor Jack Markell, a challenge: "What can you do to help art grow and function?" -- a challenge that was received optimistically: "The governor stepped up." In the coming months, Film Brothers plans big events such as a movie-themed Battle of the Bands in March, and a Street Festival on Market to help raise funds and create business opportunities next June. In the meantime, they hope for plenty of involvement, and a full calendar, starting with the Movie Co-op Opening on Saturday November 13, featuring local arts and the opportunity to learn more. Find Film Brothers on Facebook and Twitter. The orchestra was perched on a rooftop in a brilliant set design by Kurt Kohl which let the audience see them and made them part of the show. As soon as we were seated, Chris Tolomeo and his jazz orchestra started some warm-up numbers from his CD to set the feeling of 1920s speak-easy. Then Kitty (Leeia C. Ferguson) came out in a gangster’s raincoat to do the house announcements in a well-written 1920's patois – letting those dancer legs peak out through the thigh-high slits. Lights down, then up again showing back of a dancer who starts 'All that jazz' using the brilliant choreography created by Jody Anderson - whose 2007 Candlelight Theatre production of Chicago won the Philadelphia Theatre Alliance Barrymore Award. Not only were all the dancers top quality, but the production on opening night was as tight as anything I have seen in Delaware. Yet it was Barbara Wright's perfect cold stare/warm smile combination as Velda Kelly that made the show for me. I had seen Catherine Zeta-Jones in the film but I was even more captivated by Ms. Wright's dancing and her ability to give that "I'll-smile-when-I-murder-you" look throughout the show. Watching a few clips of the movie showed me that although the fade-ins and technical gloss give it polish, there is a dimension missing on film that you get with live theatre that I could hardly describe. When Billy Flynn, the shyster lawyer (Jeffrey Santoro) does his shtick with the dancing girls and feathers - your mouth is still hanging open and asking: can this be Delaware? The well-seasoned musical backbone of the Tolomeo orchestra gave a tremendous boost to the smoothness of entrances and dancing. Music Director Steve Weatherman and Choreographer Jody Anderson deserve much praise for this well-rehearsed show, but credit for coordinating the entire production goes to Director Matt Casarino who said he had never had a show so ready on opening night. The casting, the music and the dancing are so good that I highly recommend you catch a show during the run concluding November 13.